I’m going to go out on a limb and say that you could definitely use more mirrored furniture in your life. Why? 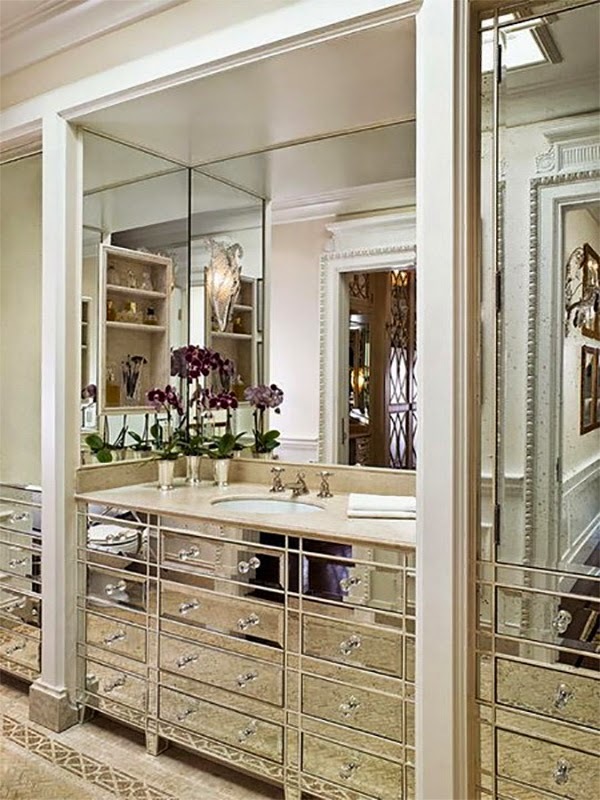 Well, because mirrored furniture adds a touch of glamour to your space and makes you feel like a million bucks! I guarantee it will make you feel good to look at too. Take a look at these fab homes and you’ll see just what I mean. Exhibit A is this uber luxurious, white bedroom (below) with a mirrored canopy bed. It’s definitely conveying that Hollywood-esque, I’m worth a million bucks feel right? 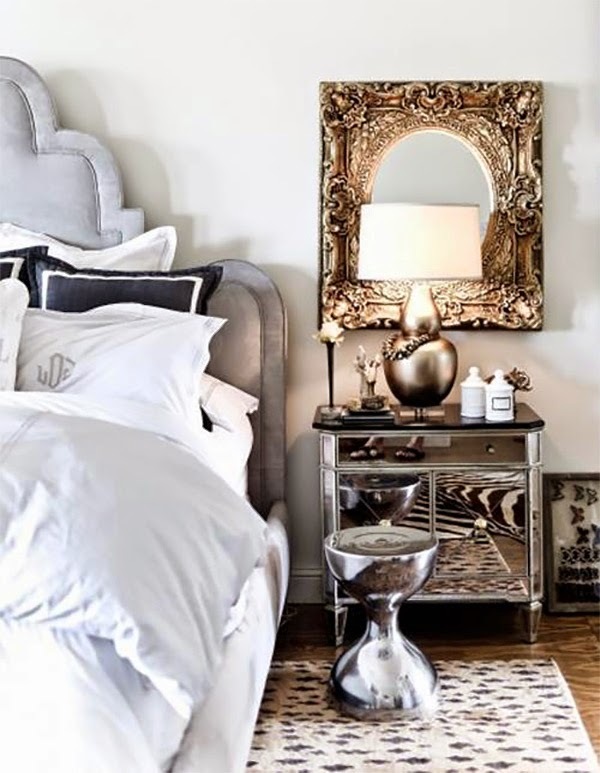 Mirrored furniture and decor accessories can do the same for your home too! Couldn’t you see yourself working the day away at this antique style mirrored desk (above)? If you think you’d like a mirrored desk for yourself, I have a two great suggestions for you coming up in this post. And don’t forget that mirrored accents can make your guests feel like kings and queens too. 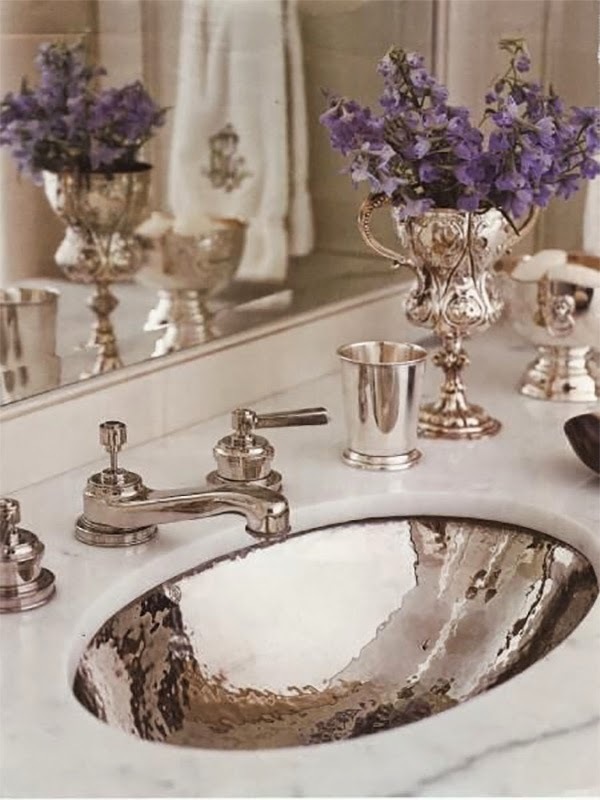 This hammered mirrored sink (above) would be a gorgeous addition to your powder room. On a practical note, I should add that mirrors are great for reflecting light, so if you have a space that doesn’t get quite as much natural light as you’d like, then add a mirror or mirrored furniture to help brighten your room. 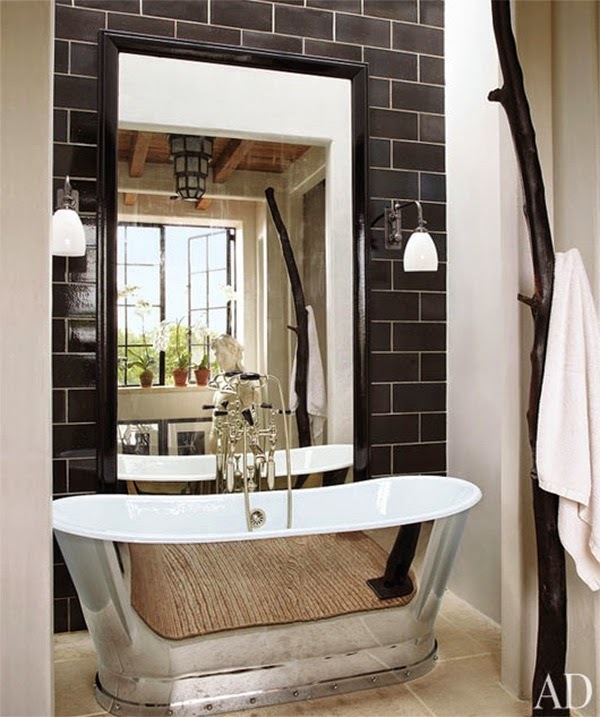 What a stunning master bath! (above) Finished nearly entirely with mirrored surfaces, you can see that it’s hard to go wrong with mirrored accents (although it is possible). With all of the light being reflected here, I imagine it’s a great space to get dressed and put makeup on in. If you don’t want to go all out with the mirrors, that’s fine. 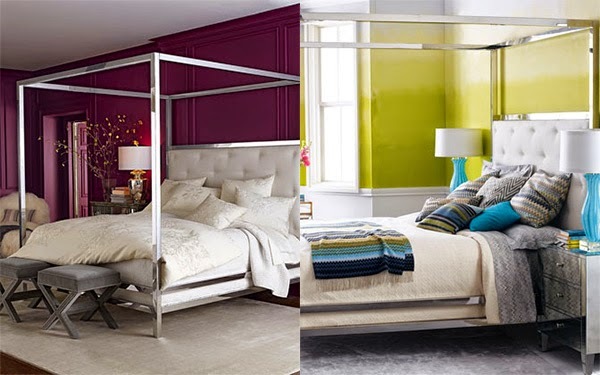 One simple mirrored accent in a room may be just what you need to “up” the glam factor. 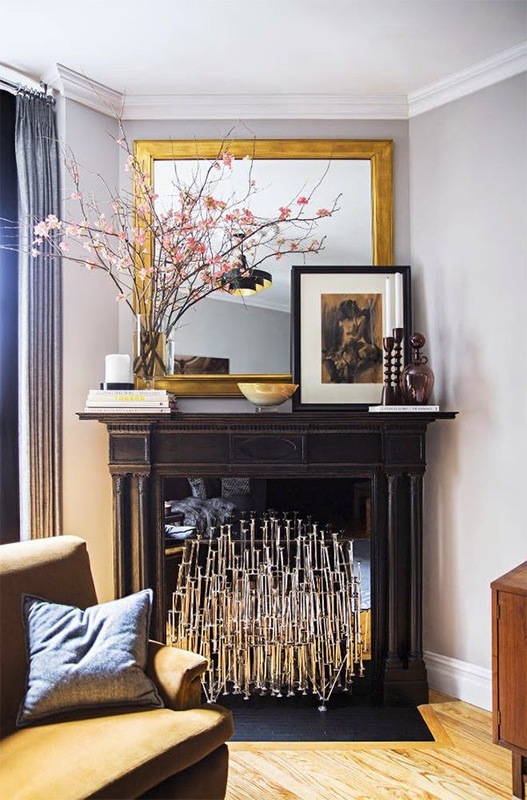 Interior Designer Rob Marvin’s living room (above) does just this, and I must say that it really works. It’s the bling in this otherwise relaxed and subdued room, and I quite like it. 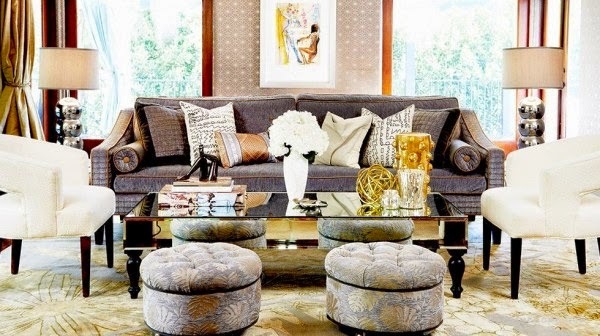 Stylish mogul Jessica Alba decorates with mirrored furniture too! In her living room (above) she features a wonderfully oversized mirrored coffee table and matching geometric mirrored floor lamps. This sophisticated space has an artful touch, which I can really appreciate. And if you love her lamps, West Elm has a very similar lamp currently– their mirrored Abacus Floor Lamp. So if you’re like me, you can’t wait to get your hands on more mirrored home decor finds. If you’re looking for a desk, consider Horchow’s mirrored Lexington Desk (pictured above) or for a budget option check out Target’s Southern Enterprises Modern Glass Mirrored Desk. If you just loved the mirrored canopy bed featured earlier, then you’ll love your own canopy bed too! Take one last look at the beauty that is the mirrored canopy bed. I so want one! My choice would be this fab canopy bed from Horchow pictured below. What do you think of Horchow’s mirrored canopy bed? I hope I’ve added a little sparkle to your day with all of this mirrored furniture. Go forth and enjoy the weekend!